You all very cautiously step into the room. You reach into the red and pull out small balls of meat--nothing that takes much time or effort, and you throw them across the room. You chuck them at the vent, the cabinets under the sink, and the door handle at the far end of the room. It takes a few tries to hit the handle. "Even weirder," Michelle says. "I don't like not knowin' what's gonna try to kill us." You peek into the vent, but decide it would be better to send a golem in rather than head that way personally. You decide to look under the sink first, just in case there's something important (or at least helpful) in the cabinet. As you're walking away from the vent, though, you hear something moving in it. Something... whipping around against the metal. Scurrying. Quickly. You and Michelle turn, and start to move to rejoin the others but you're not quick enough--the vent cover comes flying off as a monster spills out and into the room. It's faster than before, more mobile. The creature stays moving, jerking around erratically, its bones clicking as it whips its appendages about. You can hear the teeth gnashing in its head. Michelle starts to spin up her gun, aiming it up toward the meaty parts of the monster--but its tail thrashes, slapping across the front of Michelle's barrel. Between that and its constant movement, aiming is a challenge. Its jagged arms whip out at Caius and Fuse, but Caius keeps blocking the hits--turning so bone meets bone, the hard edges scraping across his chest plate and helmet. The monster is fast, though, much faster than you remember--you're not sure Caius can keep this up for very long, and that's assuming the creature doesn't change its strategy. You look behind you... and beyond Caius and Fuse. You realize that the meat walls are moving, steadily creeping inward toward each other. AH..... That thing. Fuse burn it with fire. But in all seriousness we should probably deal with Mr.Scoliosis here. Let Fuse light the head of the monster, and avoid shooting it because of the acid blood. Level fuse while he does this so he doesn’t light Caius or the monster’s.. arms. Meanwhile, Michelle ought to kick in the door, before the meat walls block it off. 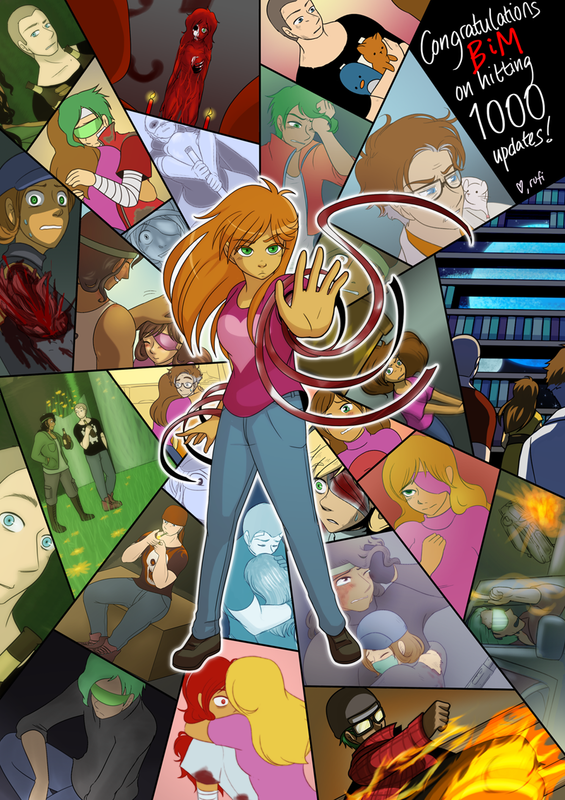 Nice art as always and happy 1000th update! Wow, what a fantastic piece! Nice work Rufi! Late to the party, but congrats on #1000, MM. Try to sync some speed and accuracy to people-- maybe bump up the adrenaline to slow down our perception of time? We need to pin the thing down with cover fire from the guns so it's stationary enough for Fuse to set it on fire. Tch, I don't like it, but we must divide our group. We can't defeat this thing to regroup before the doors get's locked. Fuse and Caius must return to the place we started, and Jane and Michelle must try the other door. Obviouslly, without giving our back to this thing. But First, Let's Fuse try to 1-Hit-KO this thing with an explosión of fire. Maybe we CAN Kill this thing and Rush to the other door in time. And even if it doesn't Kill it, it can distract the Monster enough time to enter the doors without it going for our backs. Well one exit is obviously the vent, since there's no way we're going to be able to get at the doors in time even if we turned back right this second. If we had to, we could convert the matter in their bodies in such a way that they could fit, but let's call that plan D.
Let Fuse Light it up, and warn them that the walls are closing in! It’s definitely acidic. So! Let’s pump out a bunch of sticky mucus to neutralize the acid and stop them in their tracks! Level Fuse and have him light the main body on fire. Michelle should keep trying to shoot it as long as she can avoid friendly-fire. I'm 90% certain the thing is going to make a lunge at the meat walls to cut them so they'll spill acid at us. If there's any way to prevent that it'd be ideal. Can... can we make an impromptu bolas out of sinew and meatballs? Really want to try and tie that thing down. For the walls, I'm thinking we have 2 options. 1. We know the walls can be destroyed. Fuse could attempt to slowly burn through the one blocking the door while we kinda firehose any acid that spills out with red/meat (or something more basic to counter the pH). Pulling out some plain, long bones so Caius and Michelle can try to push the walls back/slow down the advance is an option too. 2. Make some long, sturdy bones and see if Michelle and Caius can at least stop the advance of the walls while Jane and Fuse go into the vent to see if there's a solution to the problem on the other side. Be very careful as the next enemy will likely be the hands. Option 1. is the safest overall (keeps the group together) while option 2. might be the only option we can actually do. Unless we can use blood powers to open the vent more. Ammonia is just off center on being basic. It is found in metabolic waste (pee) Dilluted with water it is an irritant, and an effective agent for neutralizing acids. If well dilluted then simple dillution will reduce acids. Not safe in high concentrations. Looks like fire did the deed last time. Acids frequently are flammable. Block up the vent, prevent lil whippy from following, then exit back the way you came and wait for the inevitable squish. After dissipation of acid continue on. Next time make it so that fuse is in front of Michelle. Then fuse makes a fire in front the barrel so that when the bullets fly though they are on fire.